Digestion aids are the substances which break down food particles and help in digesting. Digestion aid may comprise prebiotics, probiotics and digestive enzymes such as Pancrelipase, Bromelain, Papain, etc. Hence, this report provides a comprehensive view across regions on these segments. Digestion aids are helpful in treating digestive disorders such as excess gas, nausea, diarrhea and constipation. Prebiotics, probiotics and enzyme could be classified on the basis of extraction source. Plant derived enzymes Papain and Bromelin, animal derived microbial culture such as prebiotics and probiotics and enzymes derived from microbial organisms. Improper eating habits are adding to the problem of digestive disorders. Digestive disorders can also be treated by changing lifestyle and diet. Healthy diet like fiber intake, prebiotics, probiotics and avoiding foods high in fat, sodium, artificial sweeteners, starches. The Digestive aid market is growing at a compound annual growth rate (CAGR) of 13.2%. Several factors driving global demand for Digestion aids major contributing factors being change in food habits, awareness among people about prebiotics and probiotics and availability of various formulations. This report provides information on Digestion aids market size for the year 2014-2016 and forecast of the same for the year 2021. 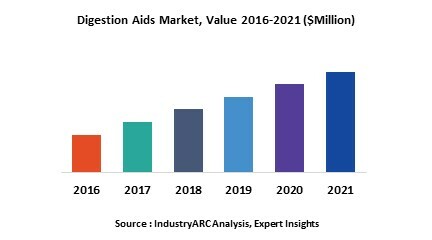 It also focuses on market drivers, challenges, restraints, market dynamics, growth indicators, competitive landscape, potential growth opportunities and other key aspects with respect to Digestion aids treatment market. As per a recent survey done by National Institute of Diabetes and Digestive and Kidney Diseases (NIDDK), millions of North Americans are suffering from digestive diseases which include peptic ulcer, chronic constipation, gastrointestinal infections and inflammatory bowel disease. Hence, Digestive Aids have higher market growth in North America. Europe is other major market after United States; consumption of digestion aids in Europe is higher and is expected to grow over next few years. Asia Pacific also has good market for digestion aids after North America and Europe. The market is majorly driven by Japanese players. 9.7. Yakult Honsha Co. Ltd.